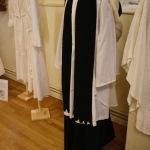 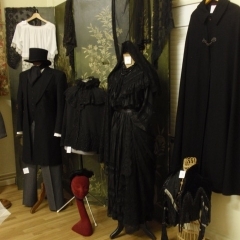 The exhibition showed some of the main outfits worn in church for special occasions, from finely embroidered christening gowns, silk and lace wedding dresses to richly decorated church vestments and somber mourning costumes. 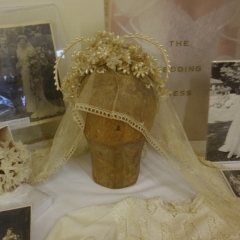 We also exhibited veils, tiaras of rhinestones and of wax flowers, bridal photographs and postcards of traditional weddings from around the world. 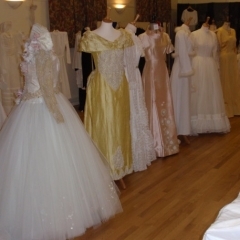 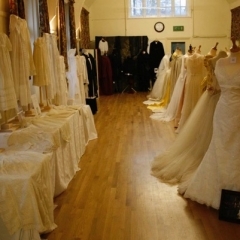 Most garments came from local families, and brides could admire the dresses they had worn once more. 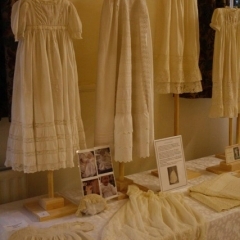 It was very touching to see a bride from the 30’s admiring her gown and reminiscing about her special day, and some grown ups were looking at the tiny christening dresses they wore many decades before, and that had been passed from generation to generation.